In case you haven't noticed, I'm hella psyched. Haha! But how could I not be? It's finally dress up day, which is one of the top three days of the whole freaking year! 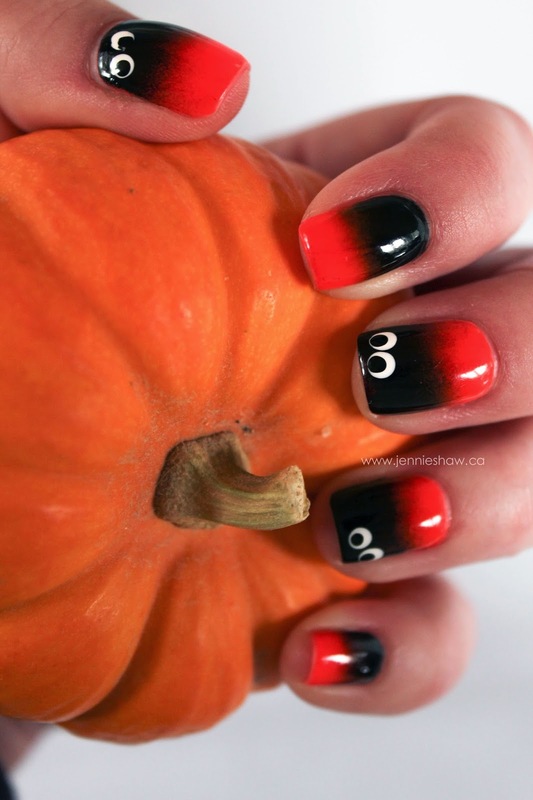 And although the mani I'm sharing this week doesn't match my costume, it's still totally Halloween-y. I started with two coats of Iconic Orange, and then did two coats of the gradient, using a triangular make-up sponge. When that was dry, I added white dots for the eyes with a large dotting tool, and added black pupils with a medium dotting tool. That's it, folks! And as much as Daniela likes to make fun of me for saying (loveyourfacegirl), it was a pretty simple mani! Haha! What are your plans for tonight? What are you dressing up as? I WANT TO KNOW BECAUSE HALLOWEEN IS THE BEST (NO I DON'T CARE THAT I'M SCREAMING). Haha! Don't forget to link up and show off your pretties! Love this! 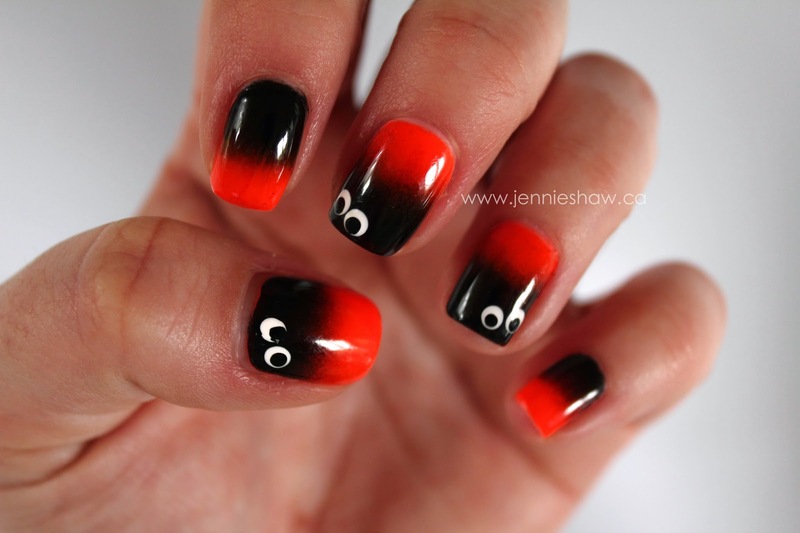 Such a great way to spice up the usual googly eyes-on-black look! And quite frankly your enthusiasm is completely and totally acceptable and I'd be sad if you weren't! haha Best day of the year!! I had my Halloween party on the 29th so I doubt I'll dress up today, just gonna sit around watching Halloween movies and editing photos from my party. hehe always love your gifs :p Great nails! I'm currently at work, dressed as Merida from Brave (which nobody is getting, but they think the bow and arrows are cool). Tonight I'd like to hand out candy, but we don't get kids AND it's raining, so....probably I'll play Diablo III with Fedora, have some homemade shepherd's pie, and drink apple juice (since I can't have hard cider). What are YOU doing? !